Valves are linear-lanceolate to elliptic-lanceolate with obtusely rounded, never protracted apices. The axial area is narrow and widens gradually into the central area, which is small and irregular in shape due to the variable length of the central striae. The raphe is filiform and straight with proximal ends that are slightly inflated and relatively close together. Striae are radiate and more widely spaced at valve center, abruptly becoming parallel and then convergent near the apices. Areolae in the striae are very fine and difficult to resolve in LM. Navicula cincta is widespread and locally abundant in streams with moderate to high levels of conductivity. 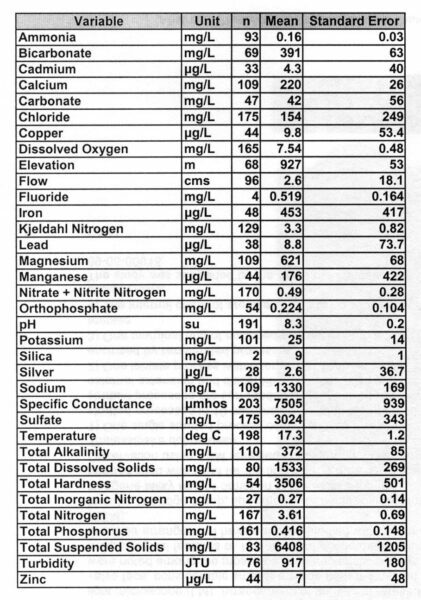 These waters tend to have elevated concentrations of chloride, sodium, and sulfate (see table below). 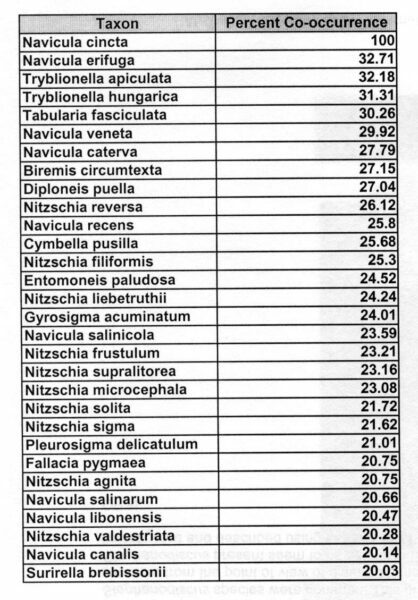 Common diatom associates of N. cincta (see table below) share an affinity for brackish and nutrient-rich inland waters. Abundance-weighted means for selected water quality variables measured concurrently with the collection of samples containing Navicula cincta. Percent co-occurrence of the most frequent diatom associates of Navicula cincta. 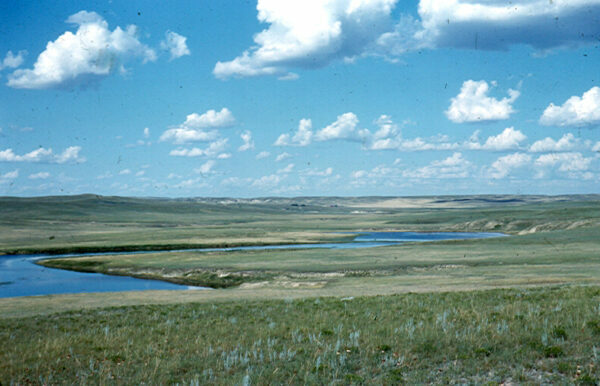 Charlie Creek, Richland County, Montana: home of Navicula cincta. Carter, J.R. (1979) On the identity of Navicula cincta Ehrenberg. Bacillaria 2, J. Cramer, Braunschweig, pp. 73-84. 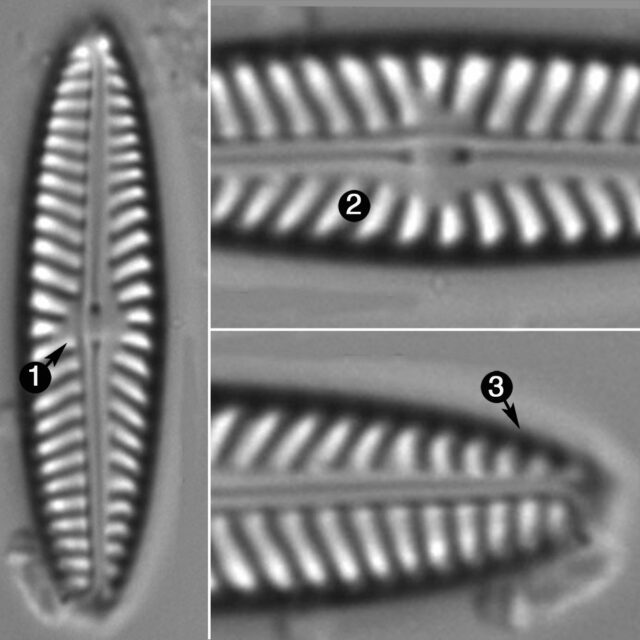 Navicula cincta has linear-lanceolate to elliptic-lanceolate valves with unprotracted apices. The central area is small and irregular in shape. Striae are irregularly shortened and more widely spaced in the central area.